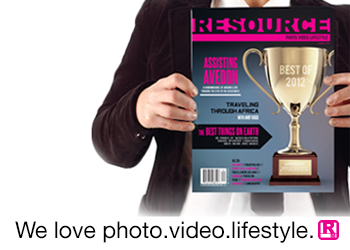 Resource Magazine is a photo and video quarterly publication. Originally focused on photography, we quickly expanded to video when technology began to mesh the two worlds. The magazine is filled with inspiration, techniques, product reviews, photo essays and interviews with big name pros. Established professionals and aspiring image-makers alike can find something to inspire or inform them, and learn a new trick or two along the way. Resource brings a fresh approach to the field of photo/video magazines, with a unique tone of voice and point of view. We talk to (and about) everyone involved on a shoot, from creatives working in advertising agencies, to studio staff, on-set crew and image-makers (be they photographers or videographers). Our articles are about the stuff that happens on (and off) set and the reality of working in this creative, fast-paced, and fun field..
Resource Magazine is available on newsstands across the US and Canada. The magazine is also distributed freely in all major photo studios, labs, and equipment rental places in New York, Los Angeles, Miami, San Francisco and Chicago. Resource’s distribution gives our readers the opportunity to pick a copy up and flip through it while on a shoot. They can take it home, still free of charge, and read it more thoroughly at their leisure and then share the Resource experience with others. And an online subscription ensures you will never miss an issue!